A Visit to the Museum that Goes Boom! 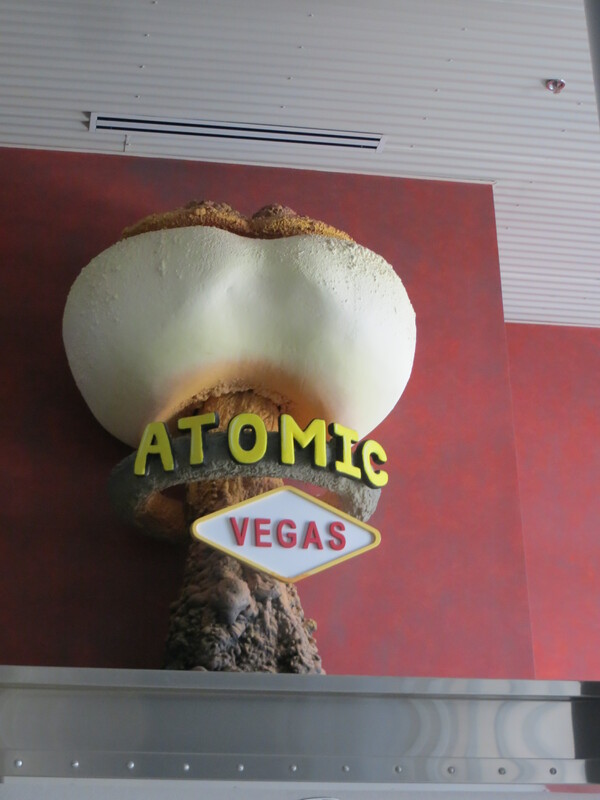 The Atomic testing Museum in Las Vegas would be among the more interesting places I visited this summer. The museum has two major exhibits, one for Atomic testing and one for Area 51. I’m really not sure what to make of the Area 51 section, and really I’d just as son not be picked up by the Men in Black, so we’ll just leave commentary on that aside for the present. Besides, the Atomic Testing Museum provides plenty of interesting material t consider. Seeing the Dina Titus reading room in there made me smile. It’s been a long time, but I do remember my old Political Science Professor rather fondly. Her book, Bombs in the Backyard would be the most obvious connection to this facility, though I’m not entirely sure how much of a role she played in the development of the museum and it’s collections. She does provide one of the more critical voices in one of the films shown in museum. I find myself wondering if her views couldn’t have received more coverage. I’d have to say the material collections in this museum are fantastic. I’ll include a few pictures, but they really don’t do the place justice. It’s worth a trip to see this stuff, so remember this place if you’re ever in Las Vegas and your hangover is under control. Of course you may also pick up a bit about Nuclear testing at the Neon Museum, because nuclear tourism was once so very Vegas. But of course the Atomic testing Museum is a long way from Neon. Much of it is drab green and grey, just like I remember my dad’s old military paraphernalia, which is very fitting I suppose. There is a tremendously matter-of-fact tone to the presentation in this museum. As you proceed down it’s halls you will learn how scientists first came to understand the possibilities which would give rise to nuclear technology; you will learn about the rush to acquire that technology during World War II, and you will learn about the many twists and turns of the nuclear arms race which would follow. Also you will learn about the steps and procedures taken to set up and run the actual facilities in Nevada.What bothers me is just how unproblematic each step in this process would seem to be in the narratives this museum provides. The Atomic testing Museum presents the rationale for each stage in the history of its subject in a very straightforward manner. It does the same with protests, and even with various decisions to scale back nuclear testing and/or to discontinue certain programs. I wouldn’t say that the museum slights the protest movement in an overt manner, but the museum leaves a strong impression that the development of nuclear technology proceeded along a rational course. Whatever the pros and cons of nuclear testing, and of specific events in the history of nuclear testing, the planning process behind that history was, at least as far as the narrators here would have it, utterly reasonable. This is of course exactly how I remember those in favor of nuclear testing presenting the case for it when I lived in Nevada. It’s also what I see whenever I dip my toes into the history of Atomic power. For whatever its worth, this does appear to be the view of those who worked in the industry. And of course those who worked in the industry are strongly represented in the Museum and its supporters. This doesn’t mean that the museum is insensitive to critics of Atomic testing, but it does mean that the narrative presentation at the museum provides a strong bias in favor of the grounds for testing in each of its various phases. Whether testing is right or wrong, so it would seem, the case for doing was always a function of careful, rational consideration. The problem is of course that this just isn’t entirely true. It may well be that the arms race was inevitable. It may well be that the bomb needed to be dropped on Japan, as so many still argue today. It may even be that we needed to keep testing for so many years into the cold war. All these things may well be (and yet they may not), but that doesn’t mean that each step in the process can be fully explained as a rationale decision by someone genuinely interested in pursuing national security. I look at such an image and I can’t help but wonder at the supposed reason for putting those troops in harms way, at least on that particular day and in that particular manner. Was this really a serious research question? Or was someone doing that simply because they could? Because they could put people out there and expose them to great danger in the name of science, and because being able to put human beings in danger for any reason must be one of the surest signs ever that you are somebody and that what you do is important. The Atomic Energy Commission’s Plowshare Program was named after a Biblical verse referring to “beating swords into plowshares.” The program was intended to find peaceful applications for nuclear weapons. The Plowshare program, initiated in 1958, sought to develop peaceful uses for nuclear explosives to construct major facilities such as canals, harbors, earthen dams, and other engineering projects. Twenty-Six of the 35 Plowshare nuclear experiments were conducted at the Nevada test site. In 1961, the first off-site multi-purpose experiment, “Project Gnome,” near Carlsbad New Mexico was fired in a salt dome to study heat generated by a nuclear explosion, isotope and energy production, and seismic measurements. The most notable experiment in 1962 was Sedan, a 104 kiloton thermonuclear detonation, equivalent t an earthquake magnitude of 4.75 on the Richter Scale. The blast displaced 12 million tons of earth, creating a crater 1,280 feet in diameter and 320 feet deep. The crater could hold four football fields, end to end. Concluding the experiments in 1973 was Rio Blanco near Rifle, Colorado which focused on fracturing natural gas-bearing formations. The Plowshare program terminated in 1975 due to waning industrial interest and mounting public concern about the environmental consequences. Not mentioned in this placard would one of the Plowshare projects never completed, Project Chariot. Project Chariot was an effort to build a harbor via nuclear detonations at a site just south of Point Hope, Alaska. Dan ONeill’s book, The Firecracker Boys provides a pretty thorough account of the politics behind this project as well as the opposition which eventually killed the project. Rachel Naninaaq Edwardson’s documentary, Project Chariot, also provides an interesting take on the subject, one focused the local Iñupiat population and their efforts to deal with the lasting impact of their brief encounter with an almost-bombing. I don’t particularly wish to rehash the full subject here, but it’s hardly a study in rational scientific inquiry. The Atomic Energy Commission ignored a great deal of science in planning the project, misrepresented the findings of its own scientists, lied to the people of Point Hope, and finally, when forced to abandon their plans to bomb the Alaskan coastline, the research team left radioactive material buried at the site without telling anyone. I think about project Chariot when I read this placard telling us about the many successes of Operation Plowshare, when I see this matter of fact discussion of Plowshare’s goals and the simple decision to discontinue it. I think about the lives of scientists whose careers were trashed because they opposed it, and I think about the people in Point Hope today still unsure of just what did actually happen in their region, still wondering what effect it had upon them. In it’s pursuit of Project Chariot, the behavior of the Atomic Energy Commission was (as ONeill suggests) closer to that of kids with firecrackers, all-too eager to blow something up, than the sort of benign search for new ways to help mankind that one might expect from reading this placard on Operation Plowshare. I think about all that, and I wonder how many similar stories never made it into the placards at the Atomic Testing Museum. Newe Segobia, the most bombed nation on earth. …did I type that out loud? Very very interesting article, Daniel. I did not know this museum existed. When I first started reading it I was perplexed by the concept of an Alaskan coming to the desert in summer – you’ll melt for sure! – but then you’re a former desert rat anyway, it seems… Thank you for this article. Good job! The museum is absolutely right! Because neither I nor any of the genius nuclear engineers were affected by the fallout or seismic damage, all these tests (along with those that blew up the pacific atolls and islands) were perfectly reasonable. I do have to admit to being slightly more upset about the two 3.5 megaton H-bombs that were dropped just outside Faro, NC, which was uncomfortably close to my back yard — especially considering that all fail-safes on one of the bombs except for one failed, and only a simple on-off switch saved us. https://infrequentatheist.wordpress.com/2015/02/05/h-bomb-dropped-on-u-s/ That switch could easily have been turned on by the impact when the bomb hit. That’s when a bomb becomes unreasonable. Just don’t do that kind of stuff in my back yard.